with 20 sessions on Open Source, Open Data, Blockchain, Wikipedia, OpenStreetMap, The Things Network etc., 5 Lightning Talks, DINAcon Award Ceremony and a loooong HACKnight. Gonzalo Casas is one of the initiators of the Things Network (TTN) and the Open Network Infrastructure Initiative. Bibi Bleekemolen is co-founder of Fairphone, the first smartphone with the label "Blue Angel". Balthasar Glättli is one of the best-known network politicians in Switzerland and a member of Parldigi's core team. Clara Vuillemin is responsible for the open source based IT platform of the new magazine "Republik". The foundation wants to make an active contribution to ensuring that Switzerland continues to hold a leading position in science and technology in the future. snowflake offers comprehensive services for the digital business. The offered services are completely tailored to our customers and the market and offer a decisive added value. In Welle7 Workspace, urban work is the focus of attention - in every sense. Whether for meetings, co-working or events. Prof. Dr. Mirjam Eggen is Professor of Private Law and Financial Market Law. She publishes on legal aspects of smart contracts. Toni Caradonna is a physicist and studied at the University of Manchester and the University of Bern. Today he works with Blockchain & Co.
Kurt Meister heads FabLab Bern, where individuals and companies can enter digital manufacturing. Diego Hättenschwiler is a scientific librarian and teaches Wikipedia courses. We specialise in interdisciplinary solutions from operating systems to end-user applications, tailored to your needs. As an independent, public company owned by the City of Bern, we provide modern living and working in the city and region of Bern. We only offer quality products with ecological properties. Swiss open source integration experts. We are your partner for custom development, conception and design and accompany you from the vision to the finished product. Under the term Trusted Business Management, ICG offers clear solutions that are implemented with fiduciary care, pragmatic doer qualities, technical depth and enthusiasm. Data becomes more complex. Our solutions remain straightforward. LugBE is a group of GNU/Linux- / Unix- / BSD-interested people and -freaks; -) in the Bern area. 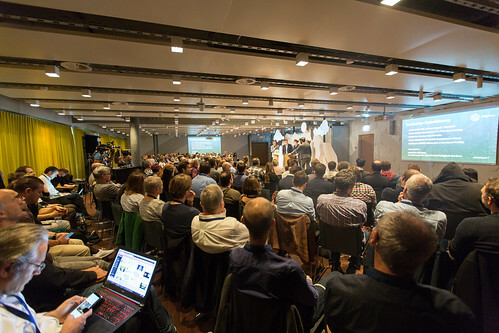 The Swiss OpenStreetMap Association SOSM is the catalyst of the OSM Community in Switzerland and represents it against the outside world. Chaos Computer Club Switzerland CCC-CH is the link between local chaos meetings and spaces in Switzerland and mediates between technical and social developments. Wilhelm Tux is a supraregional interest group that has set itself the goal of promoting the use of Free Software in Switzerland, especially in public institutions and authorities. Digitale Allmend is committed to securing public access to and further development of digital goods. Digital Society Switzerland promotes fundamental human and consumer rights on the Internet. As an NGO, it accompanies the social upheavals that are caused by the "digital revolution". Wikimedia CH promotes and supports the creation, collection and dissemination of free content to support equal opportunities in access to knowledge and education. The main focus is on the online encyclopedia Wikipedia and the media database Wikimedia Commons. It commits itself to the global ISOC statement: “The Internet is for everyone”. Non-profit association working towards a future with networking infrastructure that is more open and accessible to everyone. Our work focuses on the operation of open networks, and on the promotion of knowledge of the technologies involved. Linux Install Cafés are events where experienced Linux users install the free operating system Linux on the computers brought along by the visitors. The Swiss IGF is a forum for multi-stakeholder dialogue on public policy issues related to key elements of Internet governance issues, such as the Internet's sustainability, robustness, security, stability and development. Digital transformation is omnipresent. How can we ensure that progressing digitalisation also generates sustainable benefits for our society? One answer to this is the principle of digital sustainability. Digital sustainability describes how digital knowledge assets (data, content, software) must be created and made accessible to create the greatest possible benefit for society and the environment. In concrete terms, this concerns current political challenges relating to digitisation in Switzerland, innovation and research, data protection, copyright and technical issues such as open data or bitcoin/blockchain. The conference DINAcon 2017, which took place for the first time on Friday, 20th October 2017, dealt with these issues and was organised by the Research Center for Digital Sustainability of the University of Bern in cooperation with the Parliamentary Group on Digital Sustainability and the associations CH Open, tcbe.ch and Opendata.ch in Welle7 Workspace near Bern railway station. More than 250 decision-makers and opinion leaders from politics, business, the public sector and the digitalisation scene took part in the conference. Research Center for Digital Sustainability at the Institute of Business Informatics at the University of Bern. Association for the promotion of open source software and open standards in Switzerland. Making data public, freely available and usable for more transparency, innovation and efficiency - that is Open Data. tcbe.ch - The ICT Cluster Bern, Switzerland was founded in 1996 to strengthen information and communication technologies (ICT) in the Bern region. IT Business - the Swiss magazine for ICT. In 2017, CH Open presented the DINAcon Awards for the first time, to honor the courage and innovative strength of companies, authorities, communities, developers and individuals. The awards were presented at the first conference on digital sustainability, DINAcon 2017 in Bern, Switzerland, on 20th October 2017. Are you looking for an inspiring environment in which you can become creative yourself? In Welle7 Workspace, urban work is the focus of attention - in every sense. Whether for meetings, co-workings or events: Meet your customers in the middle of your company locations, between home and workplace. With its modular, versatile room categories, the Welle7 Workspace offers the right concept for everyone. Additional services such as catering, childcare and conference room technology, such as video conferencing systems or simultaneous translation, can be added as required. Give your meetings, projects and events new perspectives and reserve your space in Welle7 Workspace now.